Write On! I made the paper…I really did! 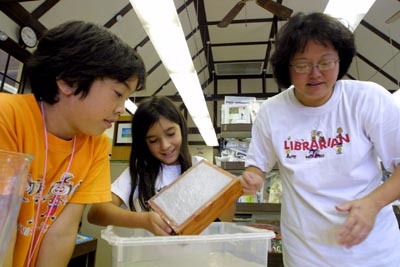 This week is National Library Week. No, that doesn’t mean your library fines are forgiven, I already asked, but it does mean that we should celebrate what our libraries do to enrich our lives. 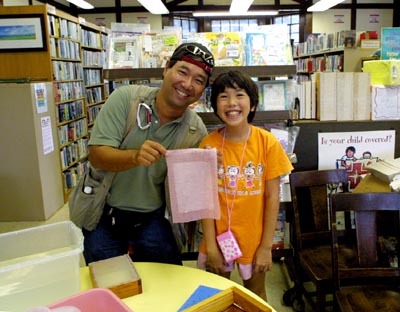 And for this celebration The Bond Memorial Library in Kapa`au had project days this week. 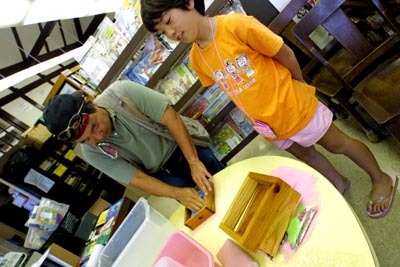 I happened to stumble across the library when they had a paper-making workshop scheduled. Here’s Dawn, left, helping Mealani, right, work in a slurry of paper pulp to create a layer on a screen to make paper. Kristi waits her turn for her paper-making. 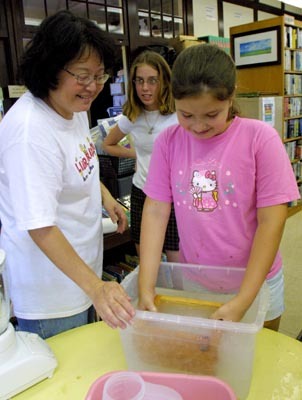 Ha`ale, center, gets the paper pulp on a screen out of the water for her homemade paper. Jenna, left, and Dawn check-out the action. Even I got into it as the girls insisted that ‘Mr. Cameraman’ make some paper. I sloshed the pulpy slurry, gently pulled the box frame out under the careful supervision of Jenna who already created several pieces of paper, including some glitter sandwiched papers. Then I had to sponge the excess water out of the paper screen. Tah-Dah! I made the paper! And here’s my piece of homemade paper. No, it’s not the Handy-wipe I’m hanging onto, it’s the white rectangle attached to it. I have to let it dry before I can separate it from the handy-wipe towlette. Thanks to Dawn for the customized post-it notes (and taking photos of me for my blog), Ha`ale for my National Library Week pencil, Jenna for guiding me in my paper-making and especially Mealani who said I look 20 years-old.